The clock was well and truly turned back with the return of 250cc two strokes to the TT Mountain Course for the first time since 2002. 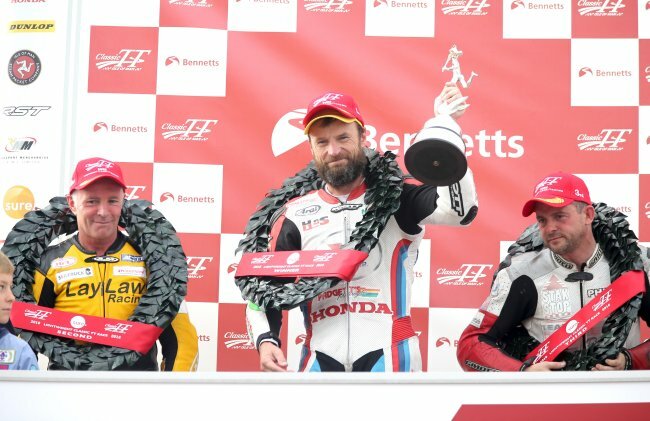 In a stunning race Bruce Anstey posted the fastest ever Lightweight Mountain Course lap on his way to winning the inaugural Sure Lightweight Classic TT Race, the second race of the day at the 2016 Classic TT presented by Bennetts. The team, and Bruce, now has the distinction of holding both two stroke records, following the success with the YZR 500 two stroke Yamaha last year. “I thought I’ve just got to make sure that I get away from Ian (Lougher) so he doesn’t see me. I enjoyed that – it’s so good to be back on a 250 it’s such a pleasure. Once I got on the last lap I just cruised. They fire up pretty easy so I wasn’t too nervous in the pits. The Batley based dealership boss also apologised to John McGuinness for beating his fastest time. Anstey really threw down the gauntlet on the second lap and by Ramsey he held a lead of over 37 seconds from Lougher. All eyes were on the clock at the Grandstand and even thought he was slowing for the pits, the Kiwi still broke John McGuinness’s outright Lightweight TT lap record of 118.29 (19:08.200) set in 1999, posting a new fastest lap of 118.774 (19:03.876).